Where do I use my Carphone Warehouse voucher code? "Receive the UK's lowest price for trade in." "Get up to £280 for your old phone." Carphone Warehouse is a well-known retailer of Mobile Phones and has been a high street retailer since 1989. With a range of mobile phones comprising of different payment plans, such as pay monthly deals and pay as you go deals, as well as sim free phones you’ll find something to suit your needs. If you're looking for a smartphone you can choose from top brand manufacturers like Apple, Archos, Motorola, Samsung, Sony, and Versus plus much more than just the latest iPhone or Galaxy. Carphone Warehouse has a range of network options available from the top mobile networks - O2, Orange, Talkmobile, Three, T-Mobile, Vodafone, and EE. Along with a range of payment plan options, you can also Trade In and upgrade your current phone. With the phone and tablet Trade-in service, you can sell your unwanted old devices for cash, even if they're damaged or not working. Then you can spend the money on anything you want, including a new phone contract. Accessories for Mobiles at Carphone Warehouse include flip cases, screen protectors, memory cards, USB, Bluetooth devices, chargers, batteries and headphones as well as in-car chargers, holders, and kits. Buying online is easy, once you’ve placed your order there is a range of swift delivery options available. How can I track a repair? You can track a repair using the online repair checker that can be found here. Delivery to all UK mainland addresses is free. Delivery to remote locations costs £10. How can I contact Carphone Warehouse? The Carphone Warehouse stocks the latest range of mobile phones and contracts on a variety of networks such as EE, Vodaphone, three & O2. Save money while you choose your next mobile phone contract by using one of our Carphone Warehouse voucher codes. 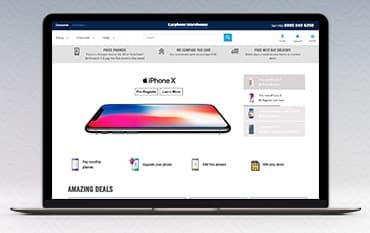 Whether you're in the market for the latest smartphone, a new SIM for your SIM only phone or even an iPad or Android tablet, The Carphone Warehouse has the right mobile and deal to suit your needs. We are constantly on the hunt for first order Voucher Codes for Carphone Warehouse to help you with your money saving. Our experts check dozens of sites for secret codes including NHS discounts, student sites & social media channels saving you time & money!